Tasseomancy, as any Harry Potter fan will know, is the art of reading tea leaves. Although traditionally associated with gypsy fortune tellers, tasseomancy originated in the middle east in the medieval period, and versions of this divination method can be found right across the world. How is it done? With difficulty! Tasseomancy is a form of scrying, which involves seeing patterns and symbols in something, and using those symbols to form an interpretation. The first few times you try this, you’re just going to see blobs of tea leaves – you do need a good imagination to get started with tasseomancy. However, the more you try, the easier it will become, like all forms of divination. Tasseomancy’s origins in the Western world can be traced to the 17th century, when tea was brought to Europe by the Dutch. Fortune tellers had, however, already been making their predictions using other, more rudimentary materials, such as melted wax. While there are specific methods for reading the patterns formed by used tea leaves or coffee grounds, the interpretation of the pattern itself is somewhat subjective, as it relies on the imagination of the fortune teller, or diviner. To read tea, for instance, one should brew a cup without using the strainer and then drain the leaves completely in the cup, in order to observe any patterns they will then make. The interpretation will depend on what approximate figure the diviner sees, whether it is a letter or a symbol, or something else entirely. These interpretations are usually guided by the reader’s knowledge of the traditional symbols used in tea leaf reading, and follows a spiral path from the outer edge to the center of the cup, from the past to the future. There are probably hundreds of more traditional and more modern standard tasseomancy symbols, but some of them are quite common and well-known. An apple, for instance, is usually a representation of knowledge and academic success, while a candle means enlightenment. Finding a cat in your reading will mean you have a deceitful friend, while finding a dog will mean your friend is loyal. Flying birds will represent good news, but ravens are bad omens. Those who want to see a wish come true should hope for a shamrock or a kite, as both of those symbols will bring a favorable prediction. As for the cups themselves, most diviners will prefer to work with a simple, white one, which allows them to see the symbols more clearly. However, some also believe there is a special meaning to the leaves’ positions in the cup, and some find that easier to read using marked cups, which is why some potteries make special cups and tea sets meant to be used in tasseomancy readings. These cups are usually grouped in one of three categories: zodiac cups, playing card cups and symbol cups. Zodiac sets contain, as the name indicates, planetary and zodiac symbols. Usually, the cup has the planetary markings and the saucer the zodiac signs. These sets are mostly used to combine tasseomancy with astrology. Playing card sets usually contain a full deck of cards imprinted inside them. It can be a poker deck with 52 cards and the joker or a smaller 32-card euchre deck. Some cards may be printed on the saucer, or it might contain brief interpretations instead. These sets are used to combine cartomancy readings with tasseomancy. The symbol sets are the ones that are strictly meant for tasseomancy, as they display symbol cues to assist the reading. These may also come with an explanatory booklet, which makes them ideal for someone who is making their first attempts at tasseomancy. 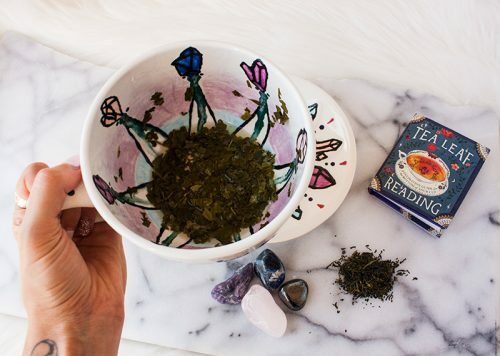 You’ll need to obtain loose tea leaves to try tasseomancy – no, a split tea bag won’t do! 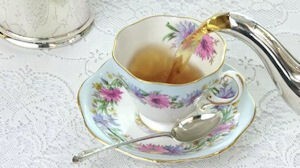 You also need a proper tea cup with a round base, and a saucer or small plate. Boil the kettle and pour it over the tea leaves in your cup. Allow the tea to steep for a moment or two, depending on taste. You can add sugar if you must, but make sure it is fully dissolved. Do not add milk. When the tea is steeped, the person having the reading should sit quietly holding the cup for a few moments, to allow it to reach drinkable temperature. During this time, it helps if he or she concentrates on a question. When the tea is ready, he or she should drink it holding the cup in the opposite hand to normal – this is said to unite both halves of the brain and will help to create suitable energies for the reading to take place. Leave a small amount of liquid at the bottom of the cup. Note that by no means everyone enjoys drinking black tea like this, so you may find yourself with rather more liquid left than is strictly necessary – small cups are a good choice, for this very reason! When the tea is all but drunk, have your friend hand you the cup and saucer. It’s now your job to swirl the liquid around the cup a few times. Received wisdom says three times, in a clockwise direction, but as with any form of divination there are no true rules, and you should experiment to see what works best for you. Then tip the cup upside down smartly onto the saucer, and leave it for a moment for the liquid to drain. And now the fun begins! Pick up the cup and sit directly opposite the person having the reading. Point the cup handle towards them; any symbols which appear to the left of the handle relate to the past, and those on the right relate to the future. Look carefully amid the blobs for symbols. Common ones include hearts, anchors, boxes, crosses, arrows, suns and moons and trees, but you could see literally anything in there! Don’t be afraid to use your imagination, as this is an intuitive reading – the tea leaves themselves are just the spark. You’ll find it very difficult to begin with. 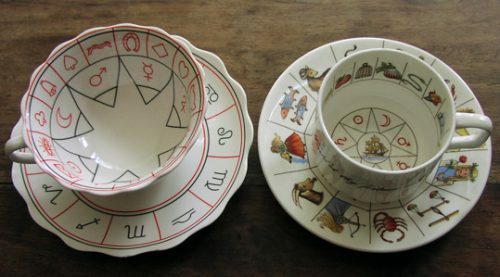 If you’d like to get more proficient with tasseomancy, you can buy special cups marked with different zones to help the interpretation, or marked with astrological symbols if you’re proficient in astrology. You’re perfectly free, however, to make up your own chart – simply draw a circle and divide it – before the reading – into whatever zones seems appropriate for the question in hand. There are no rights and wrongs here. As to what the symbols in the tea mean – again, this is up to you. You could start out with traditional symbolic interpretations. For instance, a heart represents love, a tree represents growth, the sun represents health and so on, but these will only get you so far. You need to apply your own psychic skills and intuition to work out what more unusual symbols might mean, and to blend all of the symbols together into a coherent reading.